This guide has been crafted to help you find the best eReader for you. And, that's important as while books haven't gone anywhere, and they're not about to (there's still something magical about thumbing through those pages), eReaders open up a whole raft of possibilities for reading on the go. You can carry a whole library of books in one tiny device – but which device is the best Kindle or the best e-reader on the market? The lack of dead-tree media means ebooks have the potential to be cheaper, although, for tax and publisher reasons, this isn't always the case. They're certainly quicker to get hold of – if you want to reaqd a book, you can do so with a couple of clicks on the appropriate ebook store. And you can customise your experience, making the font larger, highlighting favourite quotes non-destructively, even looking up words you don't know in built-in dictionaries. Kindle by Amazon is the most established platform, and by far the top dog when it comes to e-readers. If you want the pick up a device on which you can read all your favourite novels or textbooks, some variety of Amazon Kindle is likely to be the best option. The Kindle is lightweight and ultra slim, and thus perfect for traveling, and it has an anti-glare screen which makes reading one feel more like looking at the pages of a real book. Some Kindles also come with a backlight, so you can continue reading while your e-reader adapts to your surroundings. 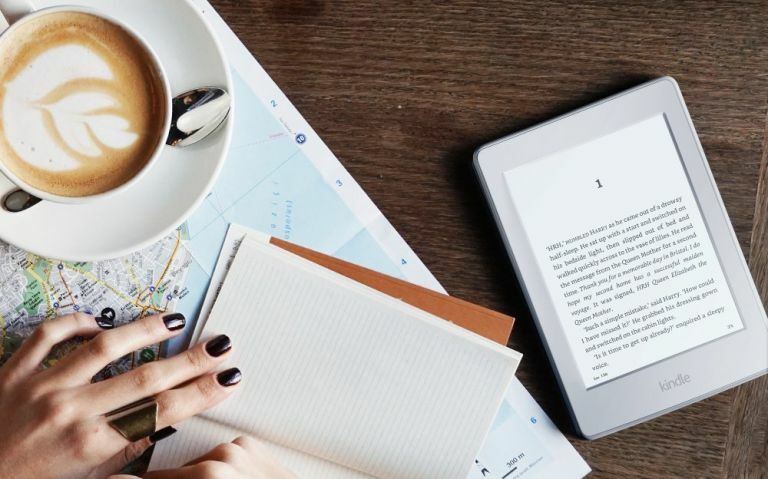 Read in pitch black conditions, read out in the sun, or even enjoy a book in the bath – Amazon's engineers have thought of everything when it comes to enjoying ebooks. The Amazon Kindle is not the only option, though. Tablet style e-readers offer similar options, and bring the added benefit of being able to use other apps and browse the internet. Battery life will, of course, not be as long with all the extra features in use or without those power-saving e-ink screens. So make the right choice for you, and take a look at our top picks to suit all lifestyles and budgets. Amazon's Kindle collection is extensive, but the Kindle Oasis is, as far as we're concerned, the best Kindle on the market. It has a large-enough screen, it's brightly lit when it needs to be, and it has built-in Wi-fi for downloading new titles. The Kindle Oasis, robust and weighty, is even waterproof up to 2 metres, which is a feature that's of questionable value but one we love anyway. We're also fond of that ergonomic design, which pushes the centre of gravity to one side (your choice) in order to make the whole thing easier to hold with one hand. It feels much more like a book than any of its predecessors. Highlighting and bookmarking is a common feature on most e-readers, but none does quite the same job as the reMarkable. It's truly an advanced e-reader, on which you can scribble, draw, and sketch to your heart's content using a battery-free pen, and use its massive screen to read all your favourite ebooks. We have concerns about its battery, which is notably shorter than most because of its more advanced hardware makeup, it's not entirely compatible with all ebook formats (although converting formats is relatively trivial) and it's damn expensive. But the reMarkable so much more than every other e-ink device, we can't help but love it. Just picking up a device to read books doesn't necessarily mean emptying your wallet on a Kindle Oasis. The Kobo Aura One, at a fraction of the price, is a great alternatice. It's functional, with many similar features to the Kindle, although it tends to jumble up your virtual bookshelf a little more than its rival. There's a backlight, so you'll be able to get stuck into a novel in bed without waking your significant other, and the screen is on the larger end of the Kobo line. Kobo's friendliness to libraries is also a big plus; if you're racking up a big ebook bill with Amazon, borrowing those books could be a much better option. As long as you're happy having a smaller screen to read from, the Amazon Kindle Paperwhite is a great little companion. It's compact enough that it'll slot into any available space in your handbag or backpack, and brilliantly clear. That name isn't just a marketing gimmick, the screen really is clear and white and oh so readable. Sometimes the light can get a little bright, even on the dimmest brightness, but that's a small niggle with an otherwise excellent e-reader. The Amazon Fire 7 is an affordable tablet that's surprisingly capable once you get into it – and it's a great family tablet, too, with a restricted mode for kids. But it's also the perfect way to access the Kindle store, and all the readable benefits of an Amazon Prime subscription. Sure, the screen doesn't have quite the serene readability of an e-ink display, and the battery can't match that of a Kindle, but if you're investing anyway, it may suit you better to pick up a device with a host more capabilities on board. Many people pick up an e-reader when travelling, because it's a far lighter and more straightforward way of keeping a big bundle of books with you, and there's no chance of your bookmark getting jostled out of place in a bag. But backpacking or hiking comes with its own risks, and the Kobo Aura H2O can stand up to them. It's waterproof, so it'll take a dunk in a metre of water, and it'll resist both sand and dust – if you're likely to be reading in extreme conditions, this is the choice for you, and it has plenty of storage so you can absolutely pack it with text. For all the upgrades it's undergone over the years, the base-standard Kindle remains a very good e-reader. It might not be the most up-to-date version, but ebooks haven't exactly changed. If you just want a cheap, solid platform for reading ebooks and perhaps purchasing from the Amazon store, this will do the job perfectly. The only thing it really misses is a backlight behind its anti-glare screen, but since there's rarely a backlight on a paper book we think you'll be able to cope.